Cost reduction is driving enterprise interest in on-premises object storage; however, compelling hybrid cloud storage capabilities also attract attention. 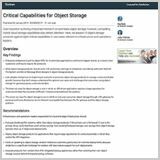 Gartner compares 13 object storage products against eight critical capabilities – capacity, storage efficiency, interoperability, manageability, performance, resilience, security and multi-tenancy, and value. It then ranks suppliers' products across five use cases – analytics, archiving, backup, cloud storage, and hybrid cloud storage. The technical and financial benefits of object storage and why it has emerged as the next-gen platform for capacity storage.